Tony – A very good, easy and well-written read. Amir Rad is a young entrepreneur who practices what he preaches about the mind/body connection for success. 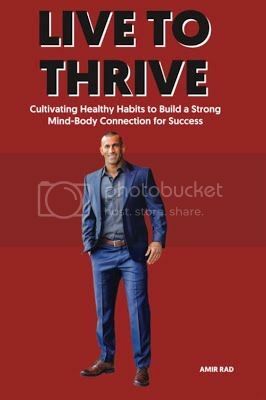 Without getting lost in details, his book effectively discusses topics such as proper nutrition, exercise regimens, surrounding yourself with the right people, and developing and maintaining good, positive attitudes. Testimonials from clients of Amir are incorporated throughout the book demonstrating how “Thrive” ideas have worked positively in their own lives. “Live To Thrive” is a book I highly recommend! Arjun – As my personal trainer who has helped me lose and keep off a significant amount of weight, it is amazing to see Amir expand into writing. Simply put – a wonderful read. Holly – Just ordered and can’t wait to read it! Amir is an amazing trainer. He’s beyond inspiring, he will help you achieve your goals and then some!! Before you read this book, I want you to imagine being the best possible version of yourself that you can be. What if you could believe that your mind and your body never stop progressing unless you limit yourself? Picture your dream life, and then picture it again. Think about what it means to you. Think about what drives you. Is it money, power or fame? Aspirations to help and inspire others? Being the best at what you do? Passion? Are you willing to do whatever it takes, and I mean whatever it takes, to reach your full potential? Not someone else’s potential, not someone else’s idea of who you should be, but your full potential. Are you willing to let go of what other people think of you, and let go of the doubts about yourself and others? Are you willing to let go of self-created fears, and then let go of what’s going on in other people’s lives, to focus on bettering your life and becoming the best you can possibly be? That is how you Thrive. When you have left behind all of your pre-conceptions and doubts about your abilities, when you have stopped comparing yourself and your progress to others, where you have carved out a space and time to endeavor, where the only option you have left is building your dream life. That’s living to Thrive.